See scan - absolutely perfect condition. 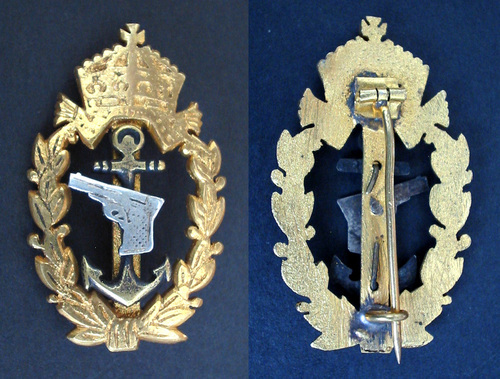 This is an extremely scarce and rare Bulgarian Royal Army NAVY / Marine pistol sharpshooter and marksman proficiency badge 1st Class in gold. So far this is the only known survived example of this rare wartime badge. The piece was awarded to both Bulgarian and German NAVY officers who served in the Bulgarian Royal fleet. During WWII Bulgaria was a NAZI Germany war ally and there were many German officers and instructors on service in Bulgaria. Scarce military / militaria collector piece and one of the rare Bulgarian badges and decorations.